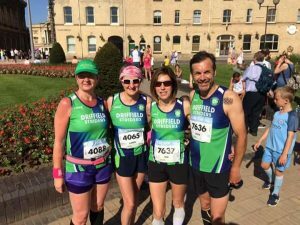 Driffield Strider David Parkin ran himself to a standstill to achieve his best ever 10K time on the hottest day of the year. David was among thousands participating in the Hull (Jane Tomlinson) 10K. Such was the heat that marshalls and spectators sprayed runners with hosepipes. Following his 39mins. 37 secs. finish, David said: “I never thought I would ever break 40 minutes and totally rinsed myself to do it today. David came second in his age group, as did his wife Zoe, who clocked 43.19. 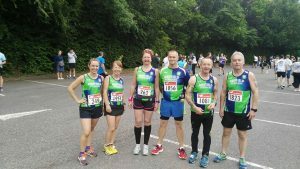 Other Striders taking part included Martin Stack (44.36), Jason Pea (50.06), Karen Falcus (60.09) and Vicky Webster (77.11). 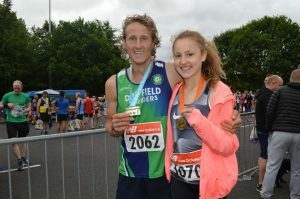 The Wilson family enjoyed double success at Sunday’s Humber Half-Marathon. 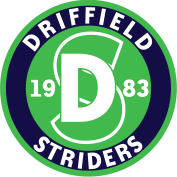 Driffield Strider James set his fastest time for the distance (1hr.21mins.19secs), in finishing 14th overall, with daughter Abbie fourth girl out of 90 in the 2.5Km Fun Run. The previous day Abbie had achieved a new personal best of 24.36 for the Sewerby 5K Parkrun. Also celebrating was Vicky Webster, whose 2hrs.24mins.39secs was 17 minutes quicker than her previous best half-marathon. She was among a Striders squad including Jazz Edeson (1.30.20), Martin Stack (1.39.41), Jason Pea (1.51.34), Karen Gordon (1.59.24) and Jo Hetherington (2.14.32). The race attracted 1,840 runners and was won by Callum Elison (Roundhay Runners) in 1.12.16. Beth Pascall (Brisol and West) was first woman in 1.26.17.